DHARAMSHALA: Expressing grave concern over the well-being of Tibetans in Tibet in view of the Chinese military build-up in Tibet, Kalon Tripa has called for more substantive support from the world community to end the Chinese government’s repression in Tibet. “Hundreds of convoys carrying Chinese military personnel with automatic machine guns are moving towards Tibet. 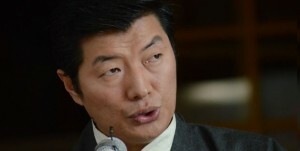 We fear many Tibetans might face unfortunate experiences,” Kalon Tripa Dr Lobsang Sangay told hundreds of Tibetans and supporters gathered at a solidarity vigil in Dharamsala today. “We really feel the Chinese government is preparing for something really tragic. Hence it is critical that the international community must intervene now to show support for Tibet and Tibetan people,” Dr Sangay said. “The Tibetans in Tibet are giving up their lives because the occupation of Tibet and repressive policies of the Chinese government is unacceptable,” Kalon Tripa said. “We really appreciate statements issued by different countries like the US and European countries. But we would like seek some more concrete actions to send delegates to Tibet to investigate the reality and the military build-up in Tibet, deaths and torture of Tibetans, and the reasons why there is repression, why Tibetans are self-immolating,” Kalon Tripa added. He urged the US to pass the Senate resolution to show support to the Tibetan people. Kalon Tripa urged the international media, including those working in China, to make more efforts to go to Tibet and objectively report why the Tibetans are self-immolating. “If the world media cannot go to Tibet, we never know what else is happening inside Tibetan areas, and how many more Tibetans are being killed and dying,” he added. Kalon Tripa said the Chinese government’s response towards the Chinese people’s protest in Wukang in Guangdong province show the discrimination against the Tibetan people. He said Guangdong governor fired local communist party officials, gave powers to the protesting groups and addressed their grievances. “Whereas in Tibet, several hundred Tibetans gathered in Dragko area, but the Chinese police indiscriminately shot Tibetans and killed them. So, the world is watching that there is a blatant discrimination towards Tibetans because Chinese can protest, their grievances addressed, whereas Tibetans cannot protest,” Kalon Tripa said. “If the Chinese government thinks the Tibet issue cannot solved through violence, force and intimidation, then it’s not going to happen because the Tibetan spirit is strong. The Tibetan spirit would remain strong until freedom is restored in Tibet and His Holiness the Dalai Lama return to Tibet,” Kalon Tripa said. “As we gathered in Dharamsala today, we can say with pride that we are joined by many others around the world from the US, Canada, France, England, eastern European countries, South Africa, South America and Asia with hundreds and thousands of Tibetans to show solidarity with Tibetans inside Tibet and to pray for those who have sacrificed their lives,” Kalon Tripa said. “We will not let your voices go unheard, we will not let sacrifices go unattended,” Kalon Tripa told Tibetans living in Tibet. Thousands of Tibetan and supporters took part in a prayer service at the Tsuglagkhang, the main temple, to show solidarity with the Tibetans in Tibet.